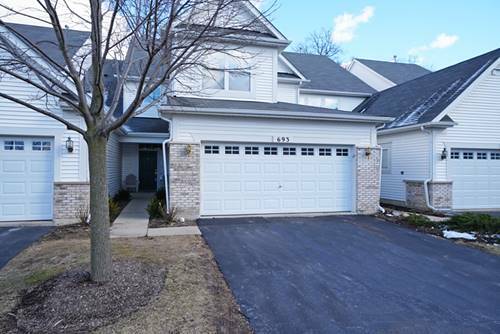 RENTAL TOWNHOME : Rare 2-story townhome rental in convenient Water's Edge location in Grayslake. Large 3 bedroom with a first floor den plus a second floor loft! Open floor plan with 9' ceilings, a 2-story entry, spacious living room and dining room. Huge eat-in kitchen with plenty of maple cabinets, Corian countertops, and hardwood floors. Breakfast area has room for a big table and a pantry closet. Second floor has a spacious master bedroom suite with vaulted ceiling, dressing area, private bath with a separate tub and shower. Big secondary bedrooms, another full bath and loft area. Neutral decor throughout. Attached 2-car garage. Minimum 1-year lease. Available July 1st. Application fee for credit and background checks required. No pets. Non-smokers. For more information about 693 Shoreline, Grayslake, IL 60030 contact Urban Real Estate.